Agapanthus is a luxury villa above Aghios Stefanos, with breathtaking views over the Corfu Channel towards Albania. It sits within its own olive grove and mature garden. The villa provides an ideal setting for a relaxed family holiday, away from it all, but close to all essential holiday amenities. It is eclectic in style and provides spacious, well-appointed accommodation, ideal for two families holidaying together. We are family with two teenage children. We have been coming to Corfu independently since 1982 and returned as a married couple in 2005 and every year subsequently. We fell in love with the unspoilt North East coast with it's stunning little beaches, beautiful scenery and friendly locals. It truly is an unspoilt bit of paradise. En-suite bathroom to bedroom 1 with bath, walk-in shower and WC En-suite bathroom to bedroom 2 with shower and WC Separate shower room with WC for bedroom 3 and 4 Guest WC Bathroom with shower, bath and WC for bedroom 5 and 6 Modern plumbing! Large contemporary furnished open plan living room and kitchen. Direct access to balcony with stunning sea views and pool terrace. Comfortable seating area with fireplace. Bose sound system. iPod docking station. Wireless Internet connection. Hi he gas oven, one electric oven. Open plan, bright, modern and fully equipped kitchen with doors leading to balcony, terrace and stunning views. Italian stone topped kitchen table and chairs. La Canche range cooker. Large fridge/freezer. Microwave and dishwasher. Basic Greek channels only - no satellite television. Table tennis table inside garage. An excellent water skiing, wakeboarding facility, run by an English/Greek couple is available at Kalami Bay, 5 mins away by boat or 15 mins by car. Notes on accommodation: Our villa manager maintains the garden and can be contacted by telephone throughout your stay, in case of any problems or emergencies. Air conditioning is included in the rental price. The villa is also equipped with Wi-Fi which is included in the rental price. No pets or smoking allowed. Outside: Shaded dining area next to living room seating 10-12 persons. Large gas barbecue. Large swimming pool built on a wooden deck app. 11 x 5 m. Deepest part of swimming pool is app. 1.8m's. Decked terrace with 10 sun loungers next to pool and 2 large umbrellas. Shaded dining area with stone topped table and wicker chairs seating up to 12 people. Lounge style seating area under olive trees with 2 sofas and 2 chairs. Lower terrace with small table and chairs. Utility Room: Miele washing machine, tumble dryer. Iron/ironing board. Chest freezer available on request. Safety deposit box. High chair and travel cot available. Cleaning / Towels / Linen / Maid service: Maid service provided three times per week. Bed linen and towels changed twice weekly. Our helpful house manager is available to deal with any problems that may arise during your stay. Other: Separate TV/family room, with 2 large comfortable sofas. DVD player. 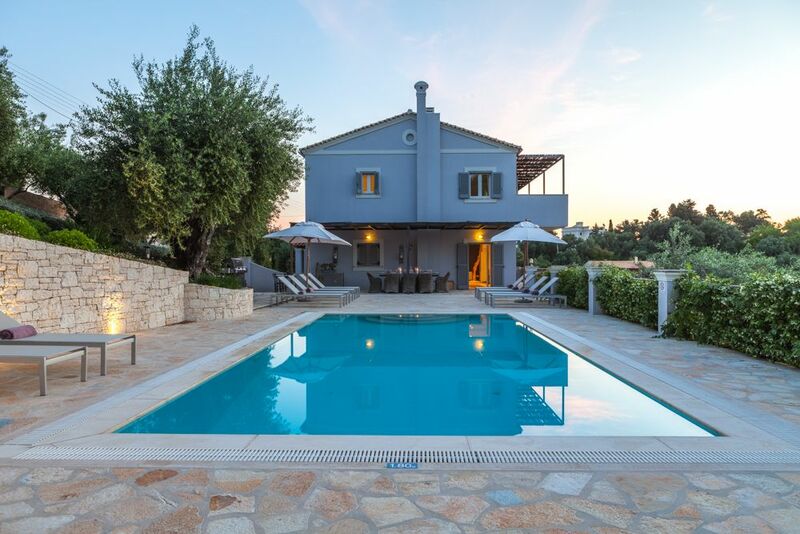 Agapanthus is a lovely villa with stunning views. The space and facilities are as described and Martha is responsive and very helpful. We loved our week here. The villa surpassed all our expectations;we immediately felt at home in this stunning but relaxing location. All our guests who came to stay fell in love with the views, the spacious accommodation, the pool area and the planting in the garden. The house itself, filled with carefully chosen and collected furnishings, provided a comfortable yet luxurious backdrop to what was a memorable family holiday. Within a short drive of local tavernas and a variety of beaches, Agapanthus is certainly on our re-visit list! We had a fantastic break at Agapanthus, loads of space for large families or groups. The layout of the villa worked particularly well for our two young families and the pool, kitchen and bathrooms are all modern and immaculate. Owners and their staff were also very helpful. Wouldn’t hesitate to return for another stay. Thank you for your kind words. According to the staff on the ground you were lovely guests to have, which makes their long season much more enjoyable. We always aim to leave the house as we would like to find it on our own holiday. Fantastic ! Great location, great views, stunning property. We have spent a fabulous week here as a party of 11 adults varying from 22-55, there was plenty of space for all of us. Every facility necessary is provided to make this property the perfect holiday accommodation . The location is ideal to explore the area or not ! As you choose. We highly recommend arranging a water taxi to Taverna Glyfa, the trip along the coast is fun, the crystal clear waters are perfect to paddle or snorkel and the welcome from Yannis and Billy tops it all off. The walk to Agios Stefanos by the path through the olive grove below the property is not easy, but was well worth the effort. We highly recommend this property and would love to return again, the owners made everything simple from the beginning. Absolutely fabulous. Beautiful views. Clean and tidy. Well equipped. Wonderful housekeeper. During the cooler months Corfu is incredibly popular with the serious walking fraternity. The nearest beach is within 2.5km, a mere 5 min drive down the hill. There are a variety of stunning beaches all within a 15 minute drive from the villa. Corfu Town with its international airport and port is a 30 minute drive away. Car hire is essential and boat hire is highly recommended. Historic Corfu Town is 30 mins drive away. Shops/Restaurants - Aghios Stefanos (shops/tavernas) 2.5 km. Nearest supermarket (Eliourgeia) 1 km. Sailing, kayak hire, windsurfing, horse riding, water skiing, boat hire - all within 5km's. Booking Notes: A non refundable 25% deposit is to be paid within 7 days of booking and is regarded as an acceptance of the booking conditions. The balance is to be paid 8 weeks prior to arrival. MAXIMUM OF 12 GUESTS ALLOWED. Changeover Day: Changeover day is Saturday, however, in low and midseason we will try to be flexible. Arrival by 4pm, departure by 11am.